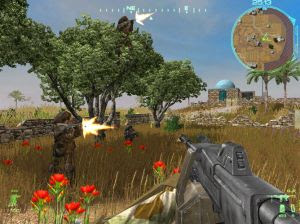 Rising Eagle: Futuristic Infantry Warfare redefines the pace and gameplay of multiplayer tactical shooters. Set in 2040, gamers participate in the conflicts of tomorrow in urban and open field infantry combat. Equipped with exoskeleton suits, C&C systems and an obscene amount of fire power go visit your dream locations: Paris and China, and then blow them to pieces! Wild freedom of movement – players can "Power-Jump" between buildings, "Power-Run" for fast sprints, breach (break) through numerous obstacles, climb trees, fall harmlessly from incredible heights (Leap from the Eiffel tower!) and much more! Play on 13 distinct maps with varying gameplay styles and tactics! Futuristic technologies that include exoskeletons for every type of soldier – every technological aspect of the game is based on current trends in military research and development. Play as one of 6 different roles: Platoon Leader, Squad Leader, Sniper, Armored Battle Engineer (ABE), Battle Hacker and Trooper. The Battle Hacker - a revolutionary player class. Players can hack enemy IT systems in order to destroy or control them, using a special dedicated interface! Over 40 types of weapons – including contemporary and futuristic ones! Autonomous weapon systems, such as defense turrets and intelligent explosive charges! Innovative command and control system, enabling fast and intelligent cooperation between players. Two completely different detailed urban settings: Paris (France) and Fuijan (China), including vast, monumental buildings (Eiffel tower and Victory gate in real world size!). Fight for one of three elite military units: the United States Marine Corps, the Chinese People's Liberation Army Marines, or the European Federation of Nations (EFN) Sturmwehr. Continuous and persistent character development - players advance in ranks and gain medals and awards according to their in-game actions. Support of up to 32 players simultaneously on LAN or the Internet.